Ever since I started working from home, I’ve been more aware of the amount and types of things we throw in the bin. Sadly more than 80% of it recyclable but due to lack of any recycling facility it usually finds its way into a landfill L So I decided to reuse and recycle as much as I can, collecting everything that I feel can be reused/ recycled in a cupboard. I had been saving so many old wedding invitation cards, calendars, paper bags, cardboard boxes etc because I knew “I can do something with them”. Finally today was the D-day when I took them and my creative side out! 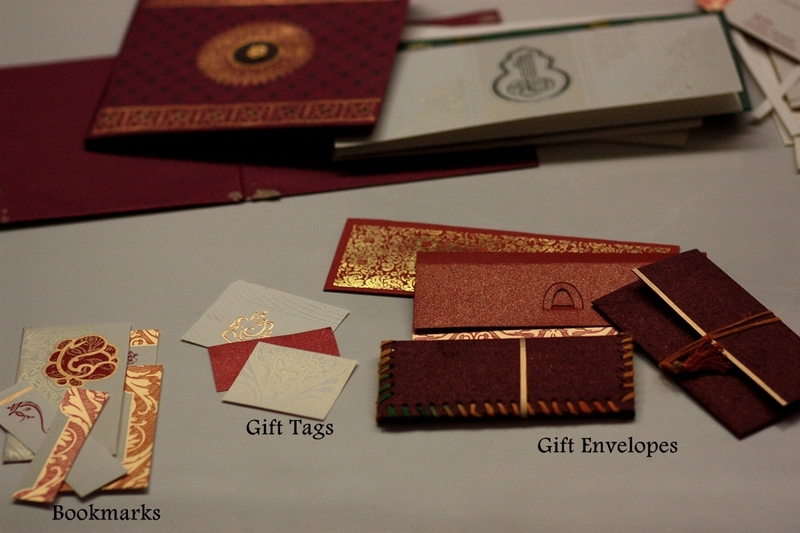 Every wedding and function we are looking around for gift envelopes and the good ones come really expensive these days. Most of the wedding cards had an outside jacket and 2-3 invites inside. I used the jacket to make gift envelopes. The invites had a lot of text but the empty space was enough to make gift tags and bookmarks :). Even though we rarely go to the calendar to see the dates (what are mobile phones for? ), every year we throw out the old and bring in a new. Last year I had got a handmade calendar from an NGO called Manav Sadhna at Sabarmati Ashram, Ahmedabad. It had beautiful origami work and quotations. For almost the first half of January the calendar was still hanging until I decided to take it down and again it went in the drawer of things with which I had to do something! My first thought was to again make gift envelopes or to use them to cover boxes and make gift boxes. But I didn’t have the heart to cut it when suddenly I realised that any two years will have matching months. May 2012 was same as Jan 2013; June 2012 same as Feb 2013 and there was the idea! Reusing old Calendars as new! There are many more recycling ideas bubbling and I’m sure to execute and post about them soon! 🙂 I would love to see more craft ideas on how we can reuse/ recycle items. Please do share your ideas or websites/ blog posts that talk about it! Fantastic…:) You are so innovative Ashima. Loved the cereal box idea, Ashima! Thanks Roli! The cereal box is a perfect size for gift bags 🙂 smaller boxes like tea bag boxes make amazing gift boxes! If you come up some more ideas do share them! because there are only so many gift boxes that I can make! btw they make for great mailboxes and paper holders on desk! Love these Ashima. I also used some of these boxes recently to make magazine stands. Will share pictures soon. Btw, have you heard about composting (check out http://www.dailydump.org). You must try it. I am sure you are going to love it! Thanks Priyanka! And do post your pictures!! Hi. Loved ur ideas about recycling. I would like to know the step by step procedures for recycle of wedding cards. Could u pls help. Sorry for the late response. I have been traveling for last 4 months with not a very regular net access. I had made gift envelopes from wedding cards and from whatever remained, of the card, after the envelope, I made gift tags and book marks. It would however be difficult to give step by step; one because every wedding card is different and you need to figure out how you can get a big piece without any text on it. 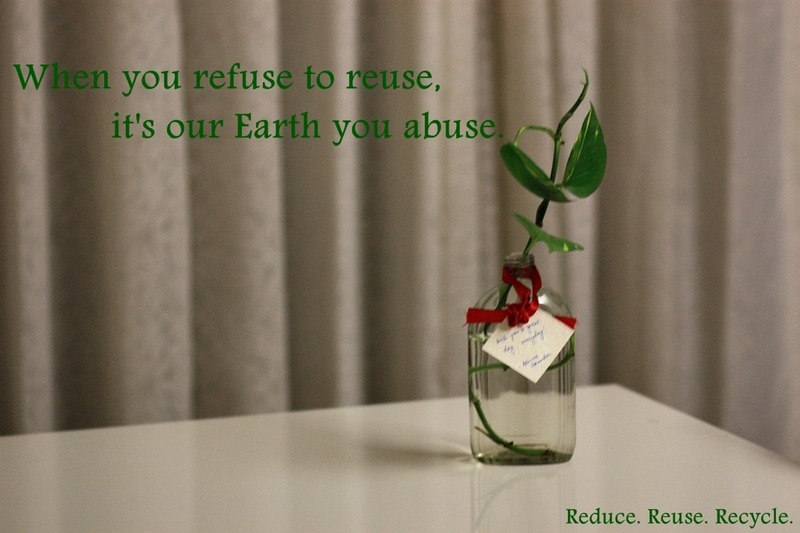 Hope you are able to reuse yours well! Awesome Nisha! And thanks for reusing! 🙂 do share your pictures! very nice post. even I have bunch of wedding card,and thinking of what to do with it. Can you post tutorial of making money envelope from wedding card ? I had sort of taken a sabbatical from blogging and completely missed out all the comments in that time. I don’t even know if you still want me to help you with wedding card recycling.. though the kind of envelopes you can make depend on the type of card you have. Wedding cards now come in all shapes and sizes and are so so extravagant! Yes I am still interested in envelope making………..
cool! can you email me pictures of some of the cards you have so I can suggest you ideas..